The total market in Belgium has been slowly growing again since 2010, but differently in Flanders than in Wallonia. In Flanders (65% of the market), a subsidy system (550€/m² or a maximum of 2.750€) stimulated the use of small systems. In Wallonia (30% of the market), the subsidy system is only present for large systems. Wallonia ended the subsidies for small systems in 2012. 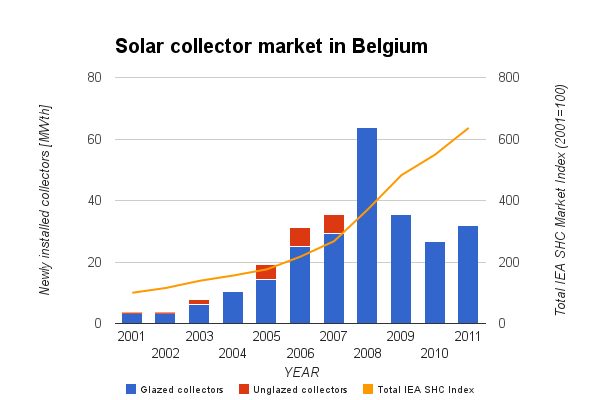 In 2012 more than 60.000 m² of solar thermal collectors where installed. Totally till 2012, the market size represents 0,043 m²/hab. The main application is domestic hot water; the systems are mainly pumped systems. For example from January to December 2012, with 4.6 m² of solar collectors, a tank of 300 l, a family of 4 persons, with a daily need of 140 l at 50°C, the complete autonomy was reach during 18 weeks; with a daily need of 80 l, the complete autonomy was reach during 33 weeks. The main market drivers are the building regulation for new buildings: the regulation requires a certain performance level and solar water heaters help to reach the requirement. But the main sales in existing buildings are with owners who specifically chose a solar water heater for environment reasons. Currently, the solar hot water systems are in competition with PV systems coupled with a heat pump. Estimates from the trade associations, for the total renewable energy sector, comes to 21000 jobs in 2011, which represents 2640 M € of business. The focus in Belgium is a very low-energy buildings, passive buildings and zero energy buildings. The obligation to reach the passive standard for new buildings will be an obligation in Brussels in 2015 and in the Walloon region in 2017. There is no national R&D programme for energy in general and for solar thermal energy in particular: the R&d programmes are developed by the Regions.